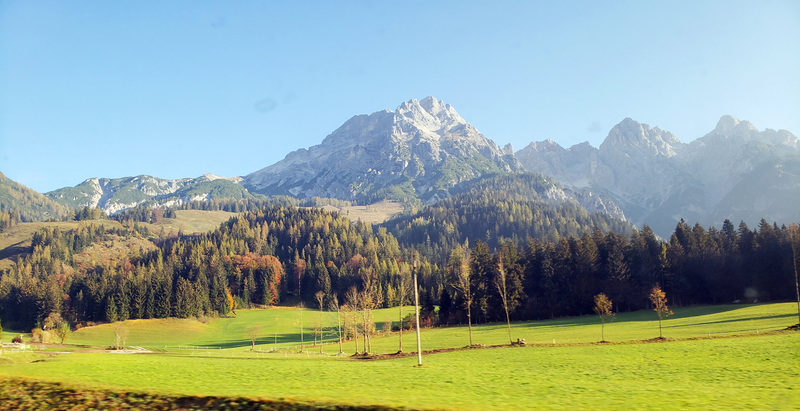 Careening around the towering Alps by train and gazing out at grand mountains, turquoise coloured streams, emerald green fields dotted with grazing sheep and cows, made me realize how much I was actually falling head over heels in love with Austria. 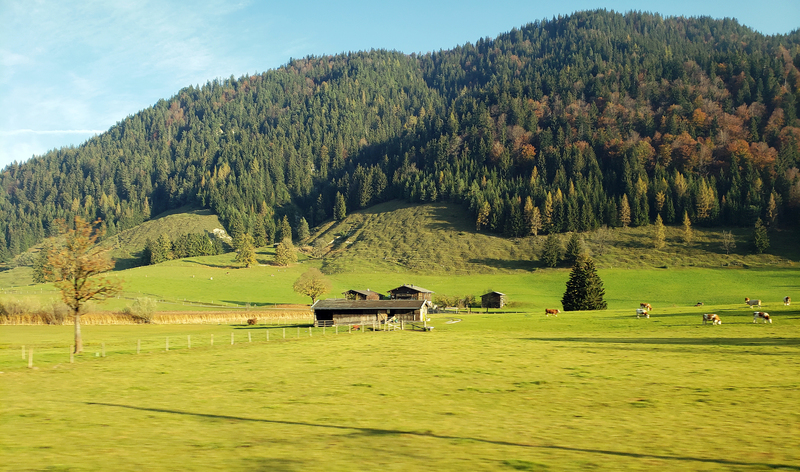 The scenic ride from Zell am See to Innsbruck was one of the prettiest train rides I’ve ever been on and as I headed towards Innsbruck, The Heart of The Alps, I jumped from window to window to get a glimpse of the view on each side of the train. 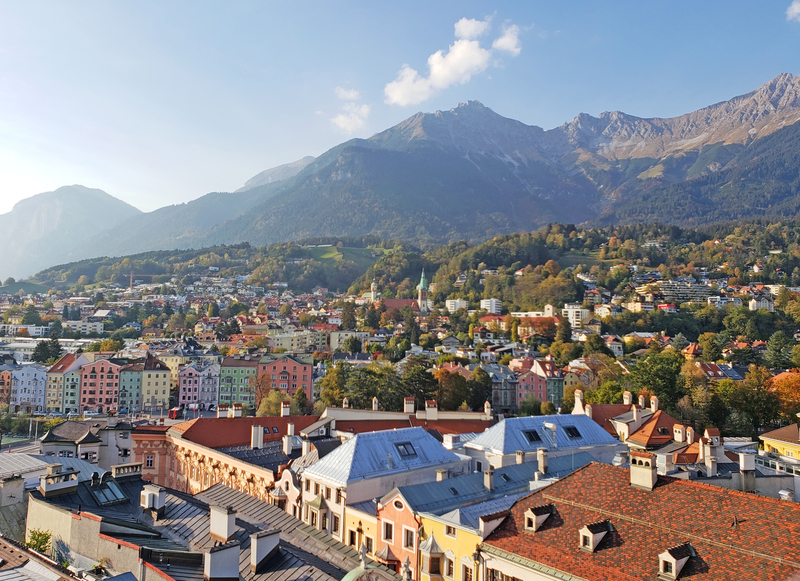 Innsbruck is the capital of the Tyrol (Tirol) region within Austria and is widely known around the world for its stunning mountain scenery, being a winter sports hub and of course, hosting the 1964 and 1976 Winter Olympics. 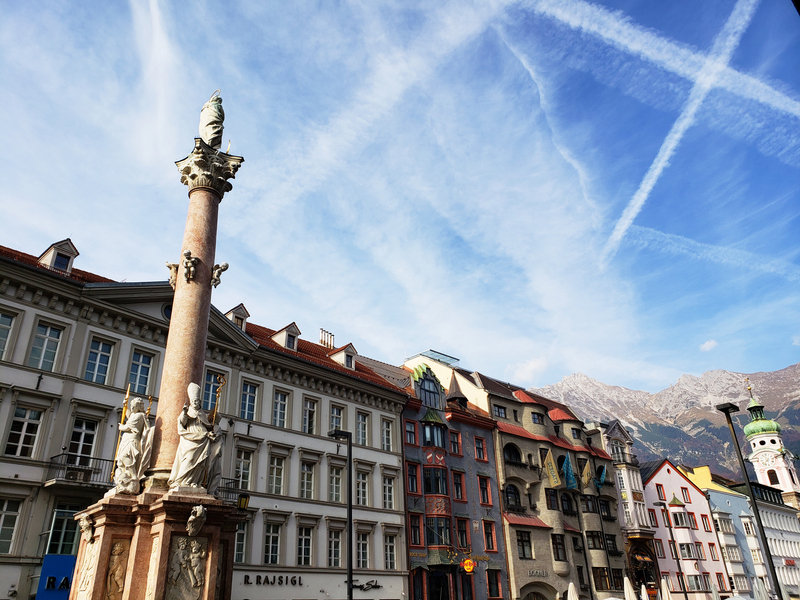 Innsbruck offers the perfect mix of urban life, beautiful nature, a historic Old Town and a dynamic food scene to cater to all sorts of visitors from around the globe. 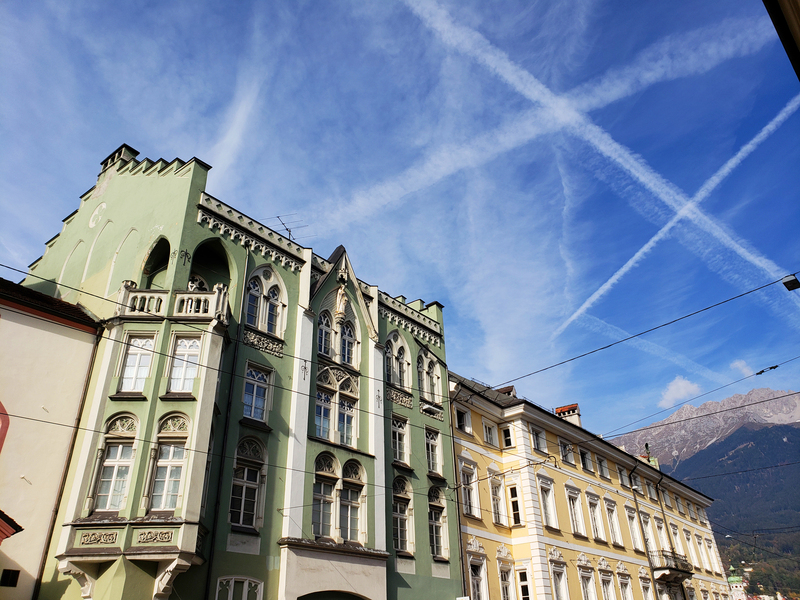 Mixing modern architecture with imperial, the streets of Innsbruck are charming and inviting whether you decide to visit one of the many traditional cafés throughout town, or simply walk along the River Inn to enjoy the views of The Nordkette Mountain. 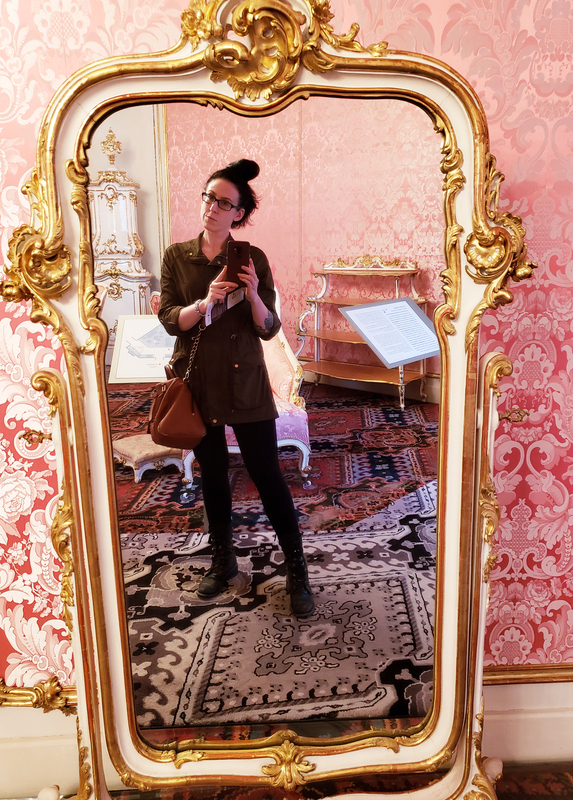 I had one day to explore Innsbruck and even though the city is fairly walkable to all the main attractions, I could’ve easily spent an entire week in Innsbruck and not been bored one single bit. 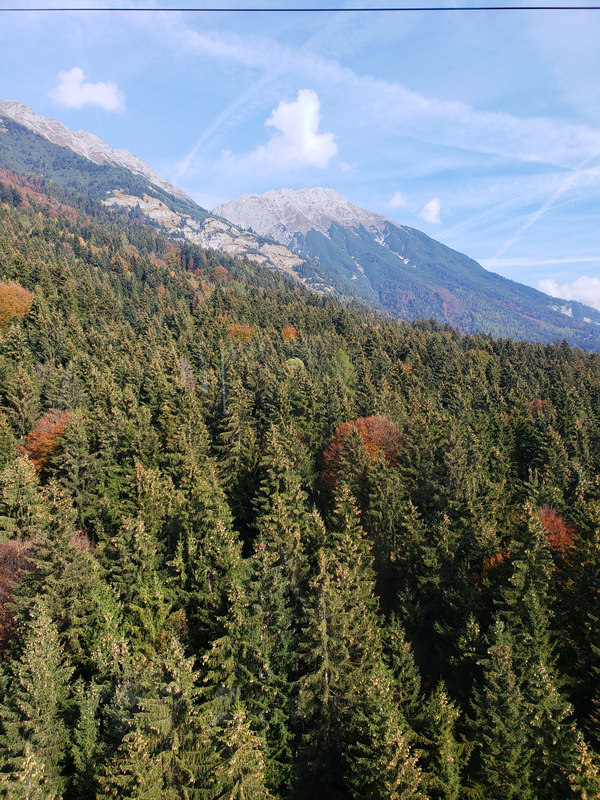 The people are friendly, the air is cool and fresh, the mountains were a spectacular site to see while wandering the streets and the coffee is strong; what more could you want in life, really? 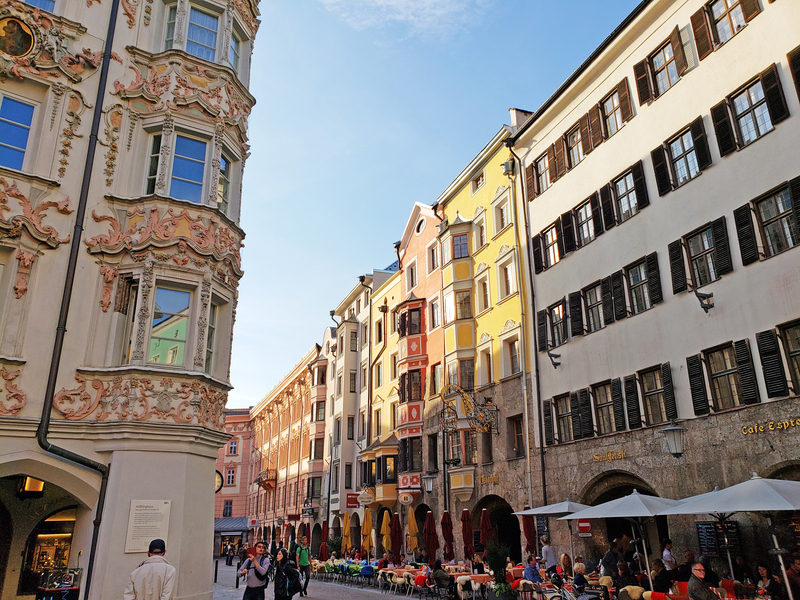 Here is a list of my places to see and things to do while visiting Innsbruck, Austria. 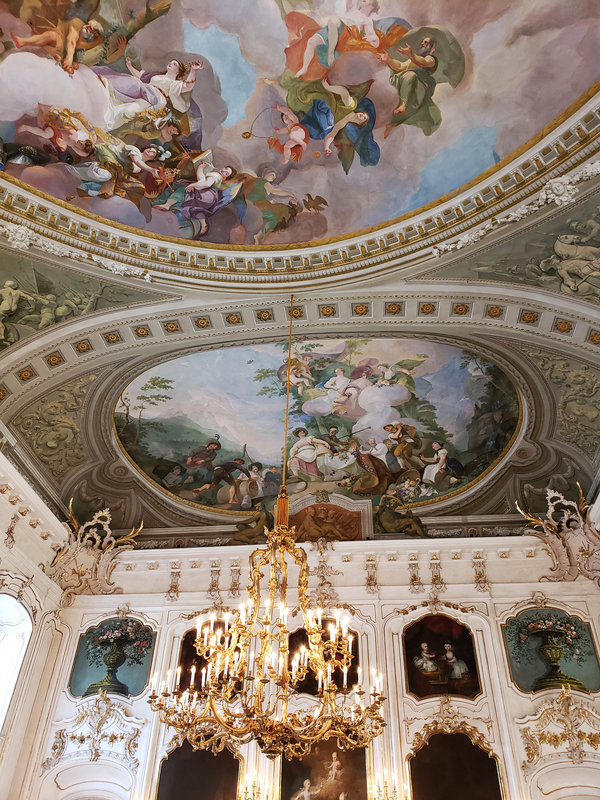 Considered one of the top three most culturally important buildings within Austria, next to the Hofburg Palace and Schönbrunn Palace in Vienna, the Hofburg Palace in Innsbruck is definitely a site you should see. 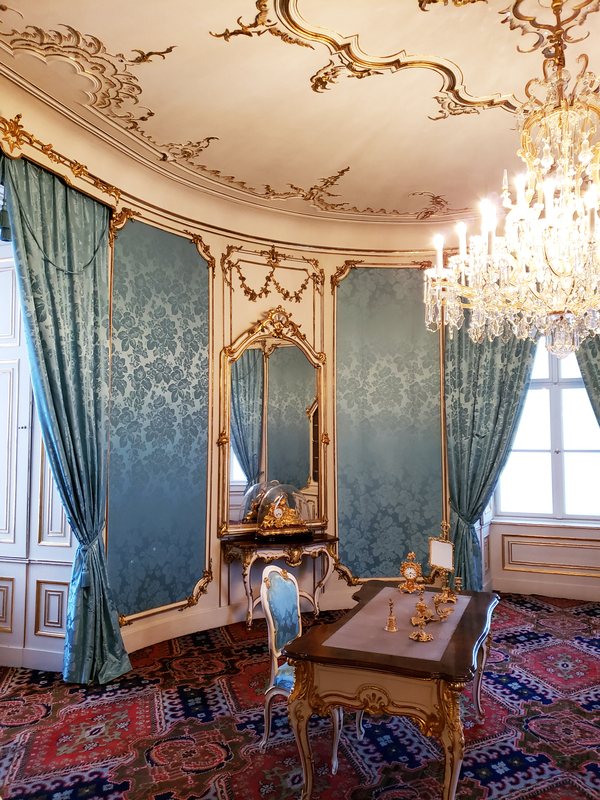 Complete with many ornate rooms, each more lavish than the next, this imperial palace will surely give you a glimpse as to how the Habsburgs lived back in the 16th-century. 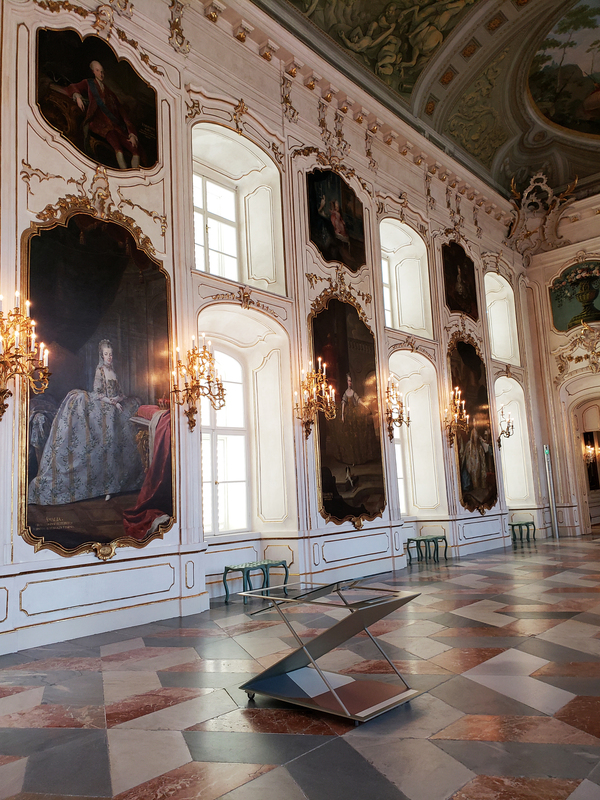 The palace is a mix of Renaissance and Baroque architecture and one of my favourite rooms in the entire palace was The Giants’ Hall (Riesensaal), which contains paintings of Maria Theresa’s children and grandchildren and now hosts many different events and banquets throughout the year. 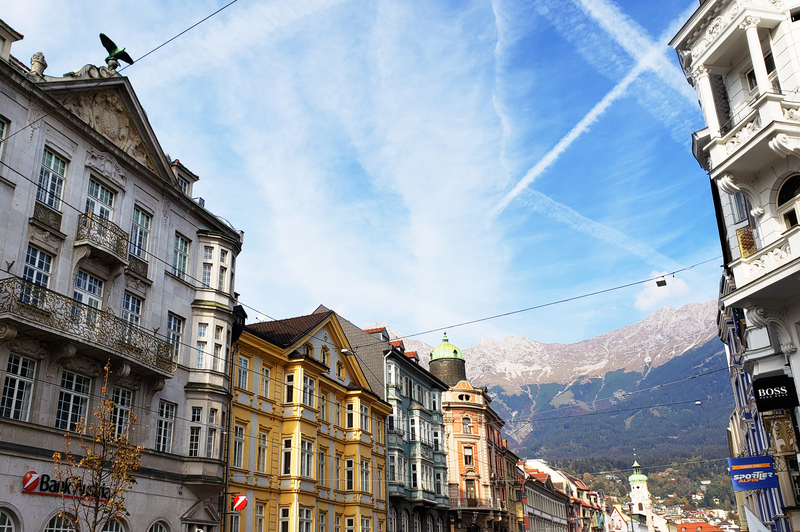 No other street within Innsbruck has quite the fame that Maria-Theresien-Straße has. 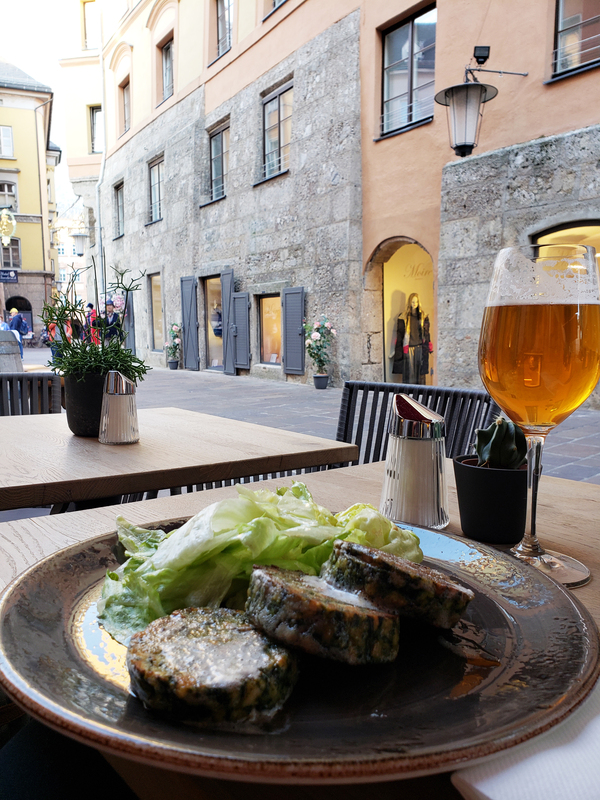 Founded approximately 700 years ago, this main street within the city is home to a ton of sidewalk cafés, shops, restaurants and of course, a dazzling view of the Nordkette Mountain Range. 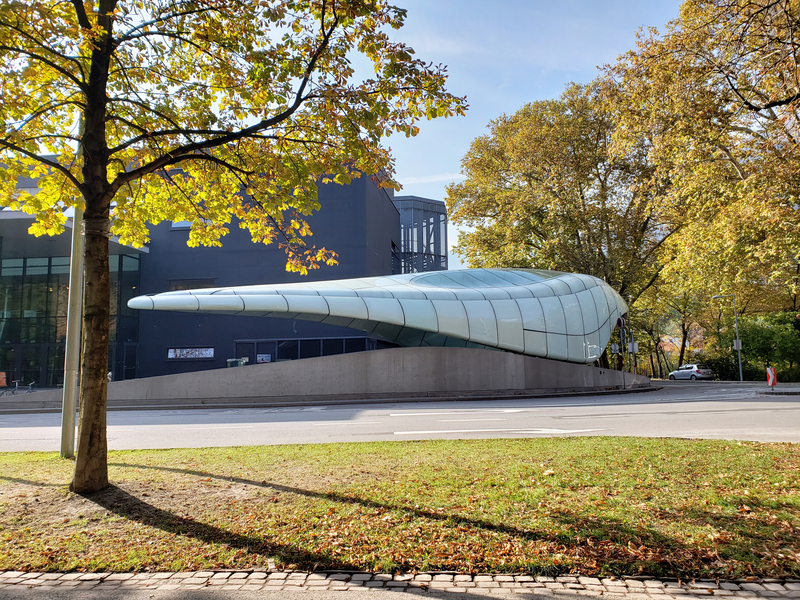 In 2009, Maria-Theresien-Straße was transformed into a pedestrian friendly zone, which has locals and tourists out and about in the streets on the daily and well into the night watching street performances and hanging out in the centre of the city. 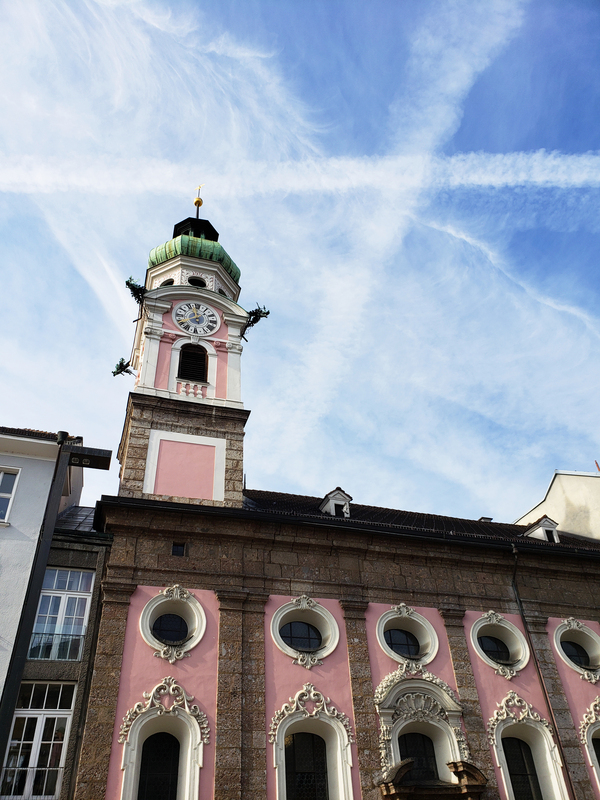 St. Anne’s Column stands proudly in the centre of Maria-Theresien-Straße and it is surrounded by four saints at the base of the column with a statue of Mary as the Woman of The Apocalypse above. 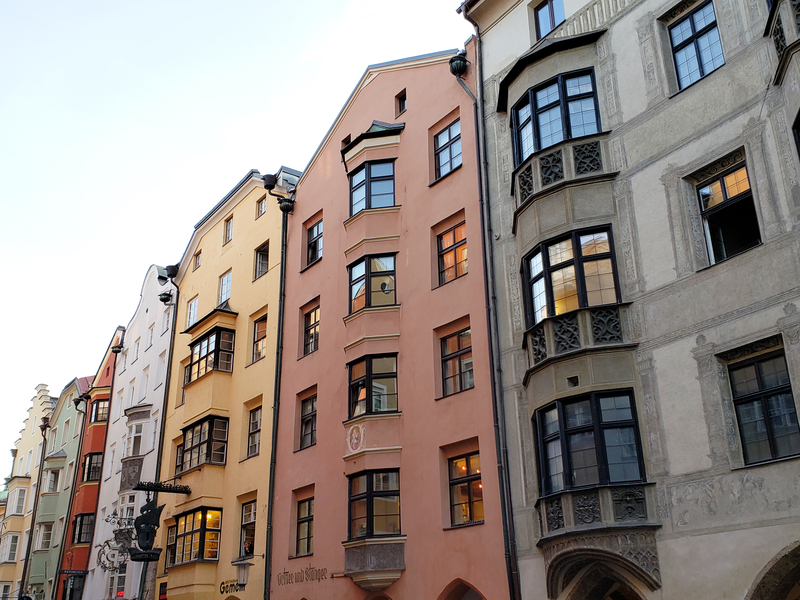 Maria-Theresien-Straße is lined with beautiful pastel coloured buildings as well, which make for some great street photography and architectural shots. 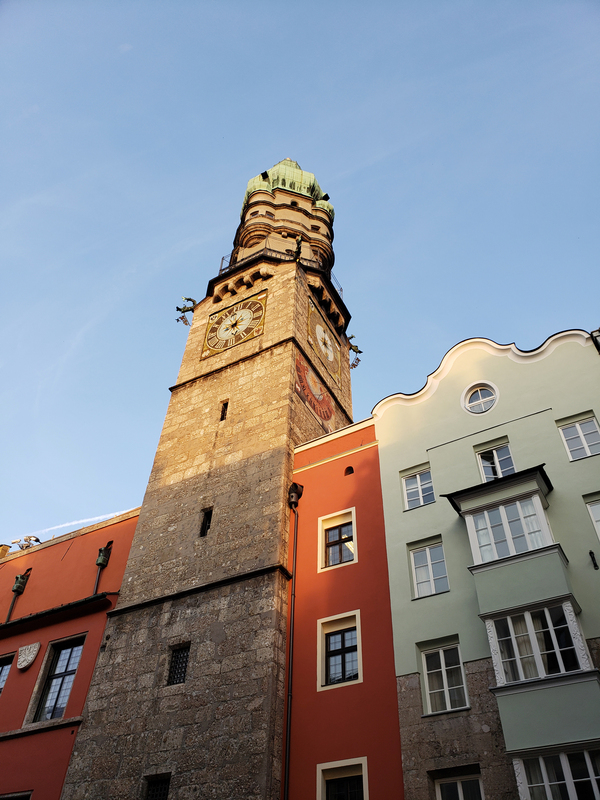 For the best views of the Altstadt and the colourful buildings below, make your way up 133 spiral staircase to the viewing platform of Innsbruck’s Stadtturm (City Tower). 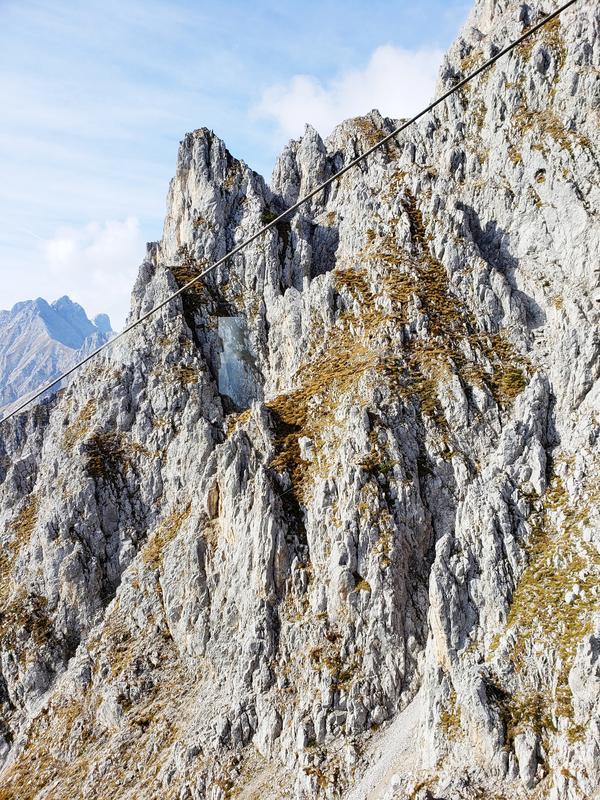 Just as the guards did for over 450 years back in the Middle Ages, you’ll be able to get a bird’s eye view of all the activity of the Altstadt 31 metres below your feet. Completed in 1450, the copper onion dome at the top wasn’t added on for another 100 years making it the highest point in the city at the time. 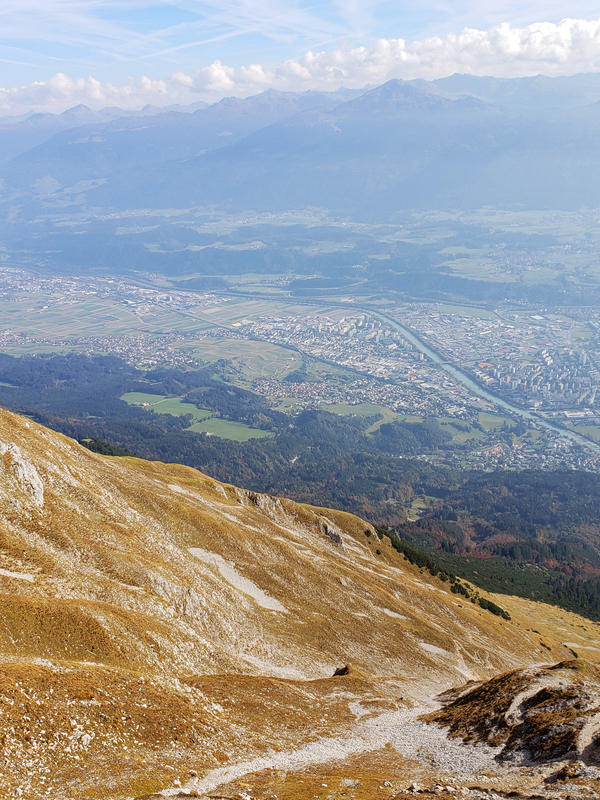 The view from the top offers the perfect 360 degree view of Innsbruck, the Nordkette and the colourful buildings that line the River Inn. 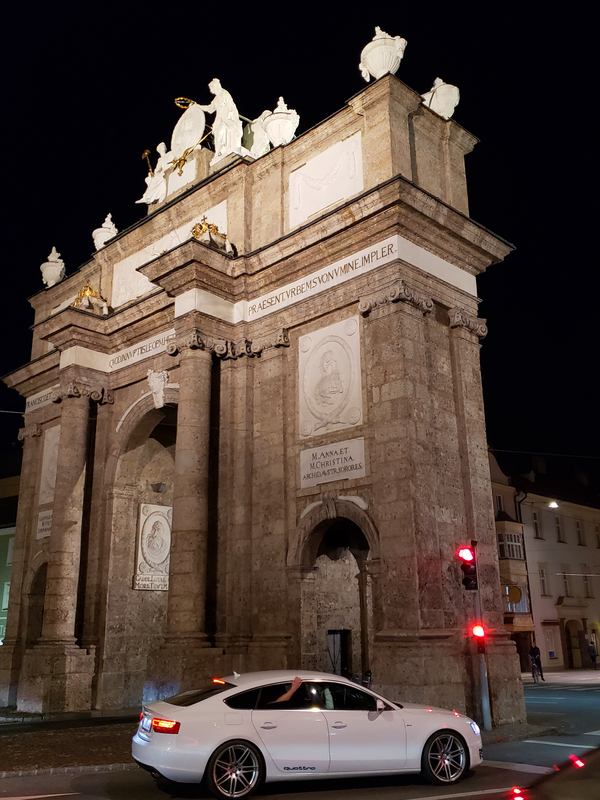 Located at the southern end of Maria-Theresien-Straße, the Triumphal Arch, or Triumphpforte is one of the most notable landmarks in Innsbruck. 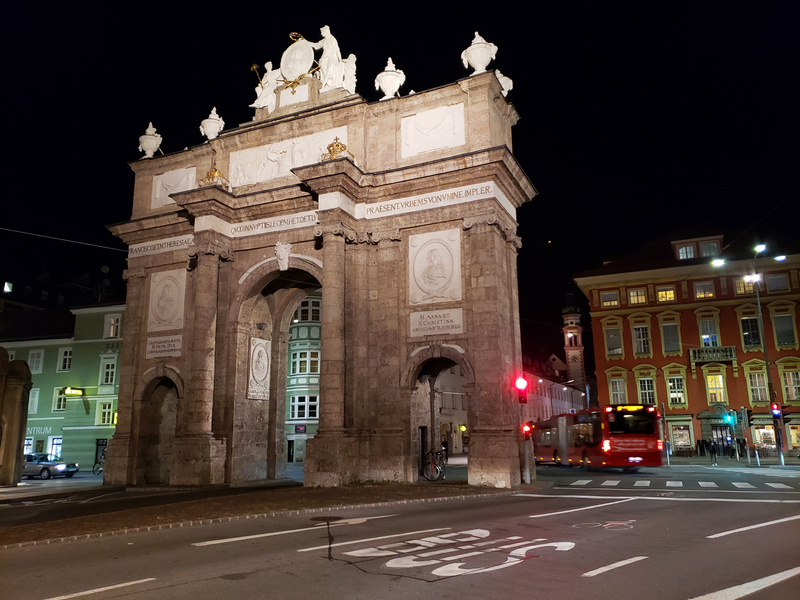 Built in 1765, the Triumphal Arch was built for Empress Maria Theresa in honour of her son getting married, as well as her husband’s death. One side of the Arch symbolizes joy, while the other side symbolizes sadness. The Arch stands tall in the city streets and resembles similar monuments that you’d see in either Rome or Paris. 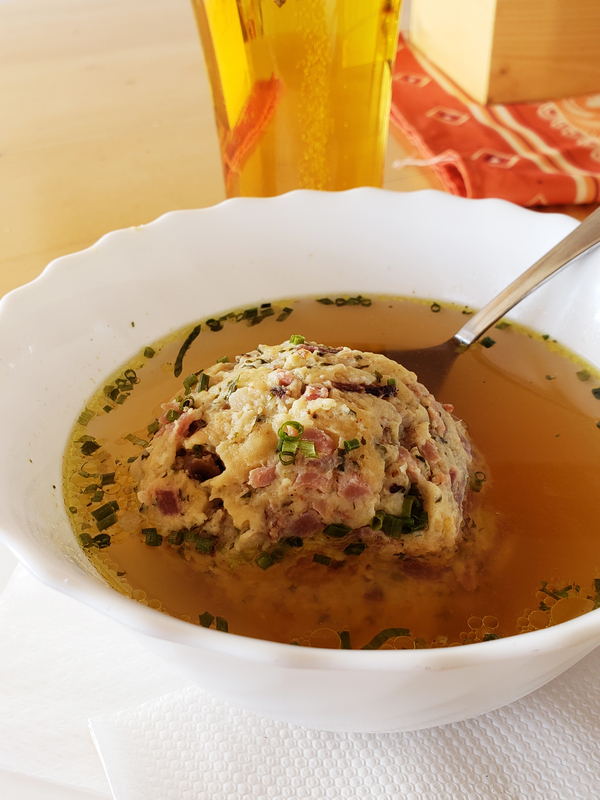 Living in the mountains through cold and snowy winters requires some hot and hearty meals and nothing beats a nice warm traditional Tyrolean meal. At the top of the Nordkette at Hafelekar, the Buffet Hafelekar really delivers when it comes to traditional dishes served up piping hot. 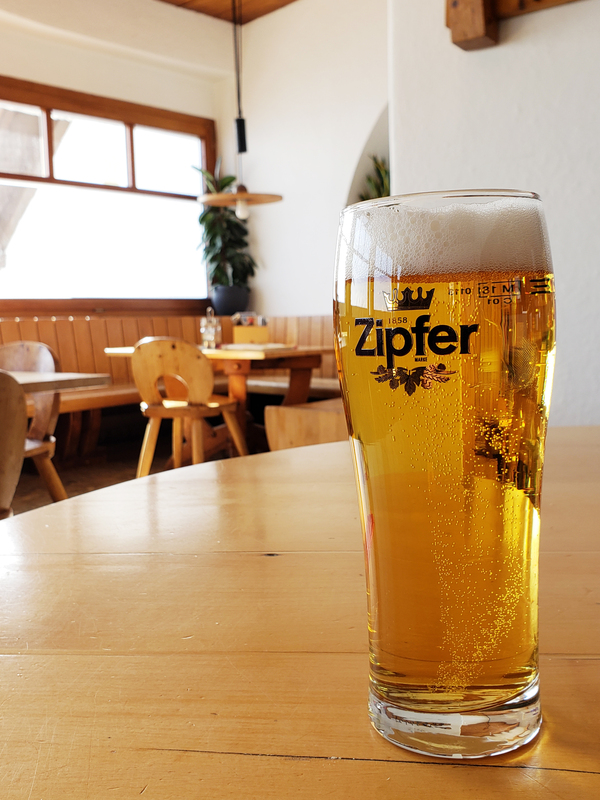 It’s the perfect way to end a hike around the mountains. I opted for the dumpling dish surrounded in a warm beef broth that just reminded me of my grandmother’s soup. It was definitely delicious and super comforting. 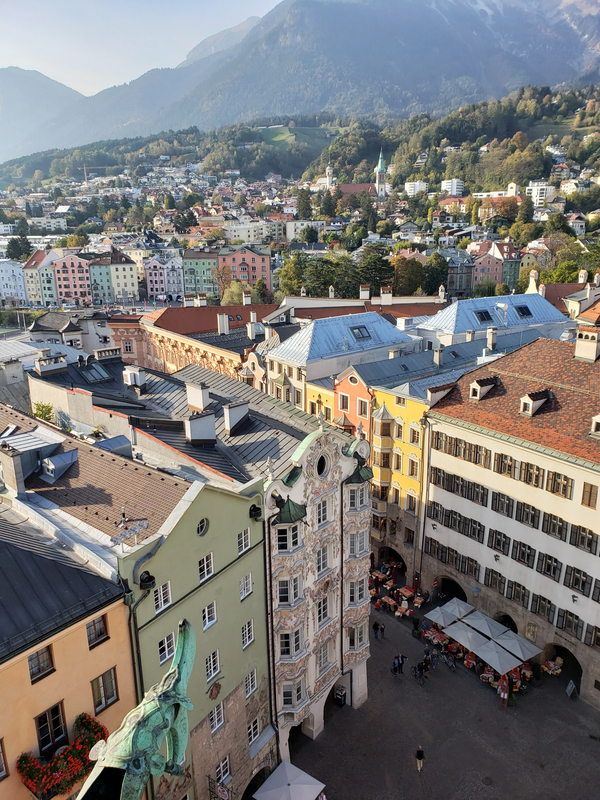 No visit to Innsbruck would be complete without spending a few hours wandering through the picturesque and colourful Altstadt (Old Town). 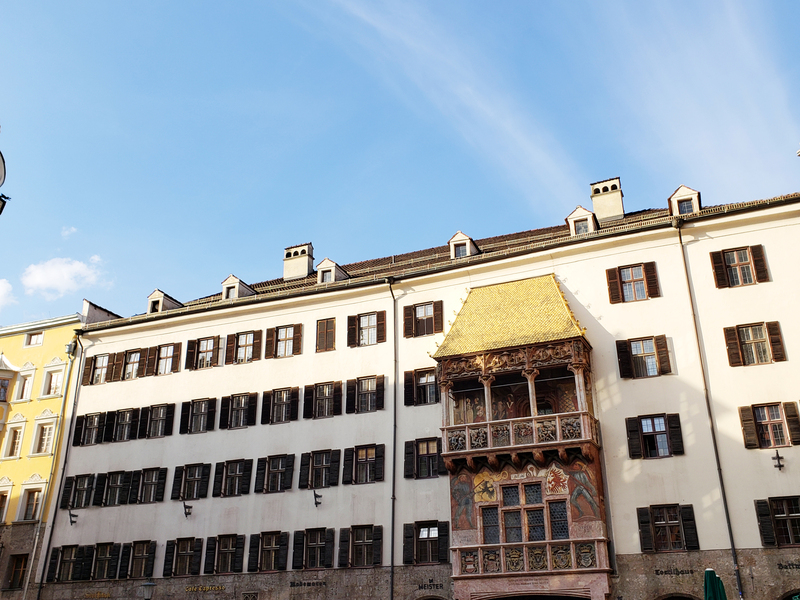 Many historic buildings and attractions listed in this blog can actually be found within this area, so it’s a sightseeing must if coming to Innsbruck. 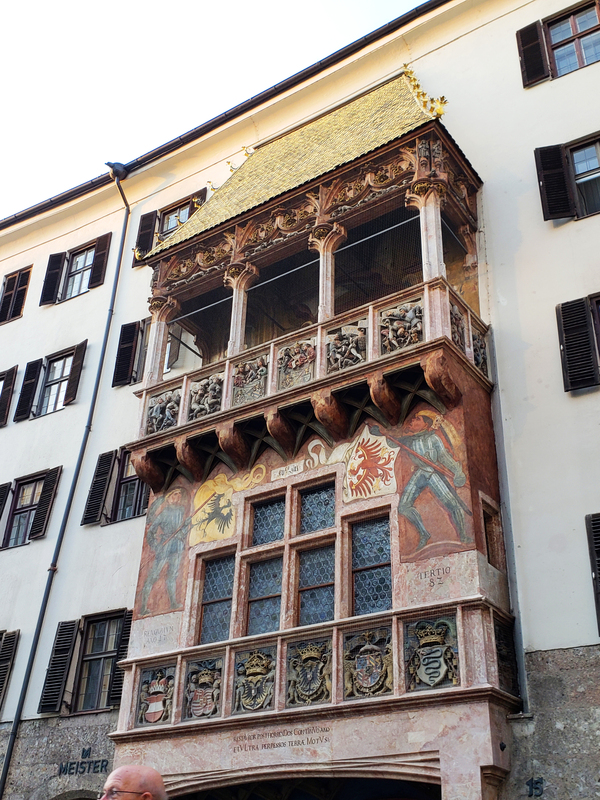 One of my favourite buildings in the Altstadt would be the Helbling House. 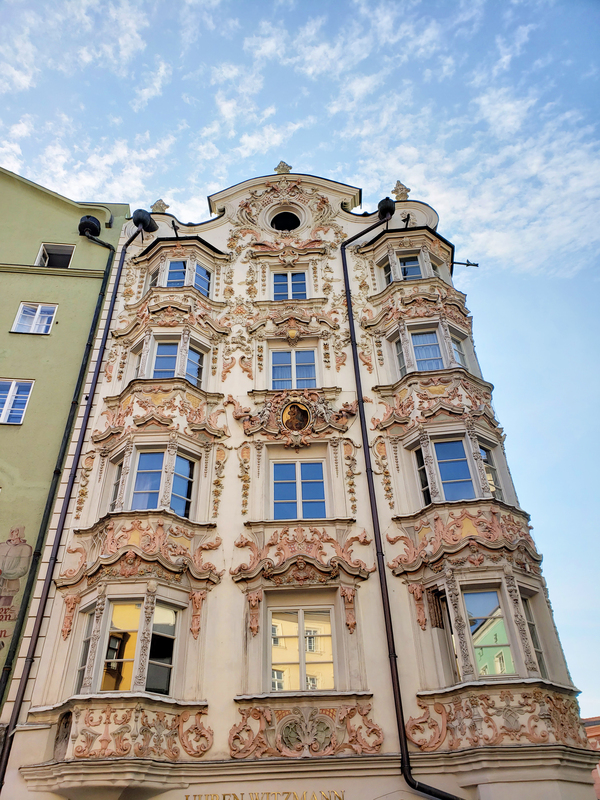 It’s Baroque exterior resembles an ornately decorated cake with fancy fondant details. 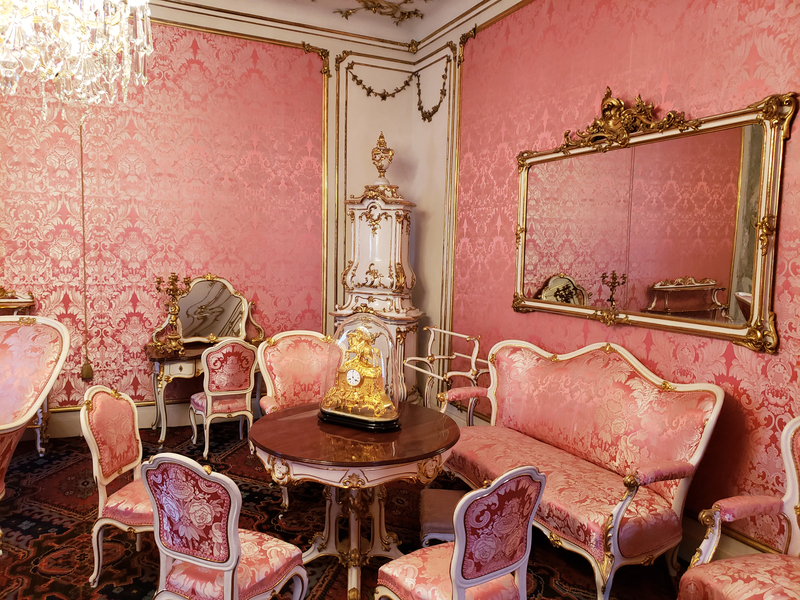 The Helbling House was completed in 1732 by Anton Gigl and was named after Sebastian Helbling, who owned the building from 1800 to 1827. 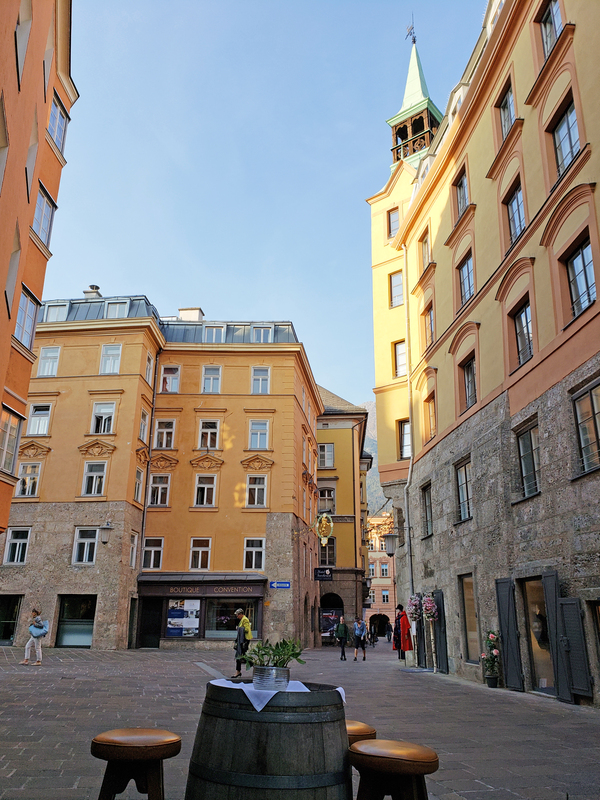 The Altstadt is a magnet for tourists, so getting there early, or later in the afternoon is your best time to avoid crowds. 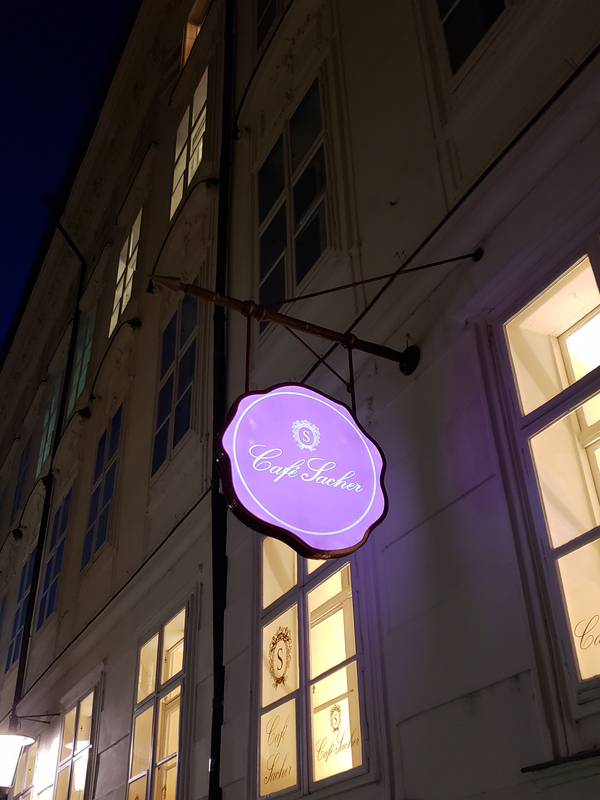 As you walk through the Altstadt, the smell of freshly baked breads, brewing coffee and other delicious culinary treats fill the air. 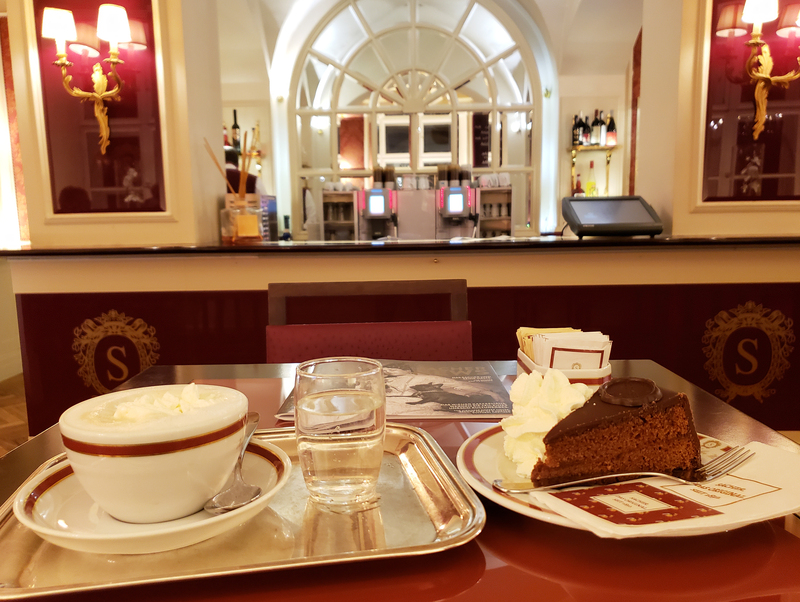 Follow your nose and your stomach and tuck into one of the many cafés to enjoy a cappuccino and a sweet treat, so that you’re fueled up to keep exploring. 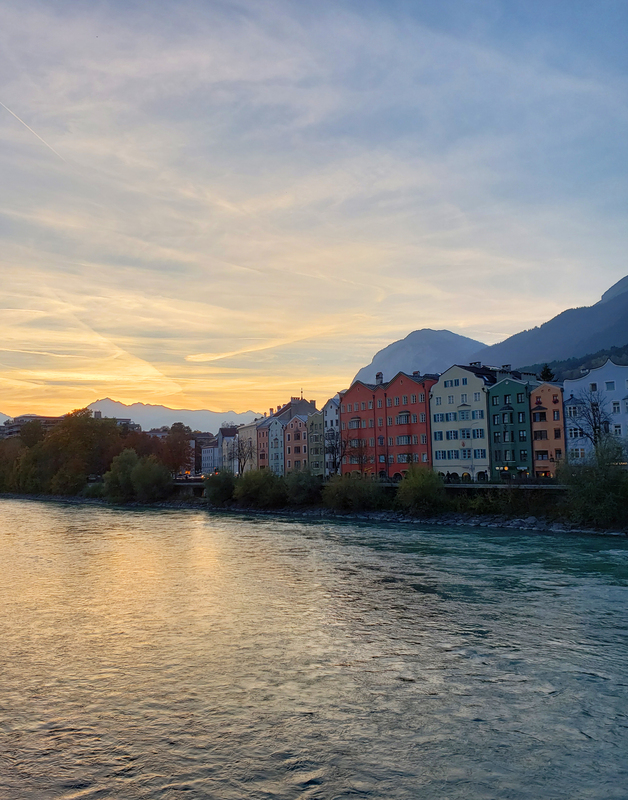 After a bite to eat and a drink, take a walk along the gorgeous River Inn; the river which Innsbruck gets its name from. 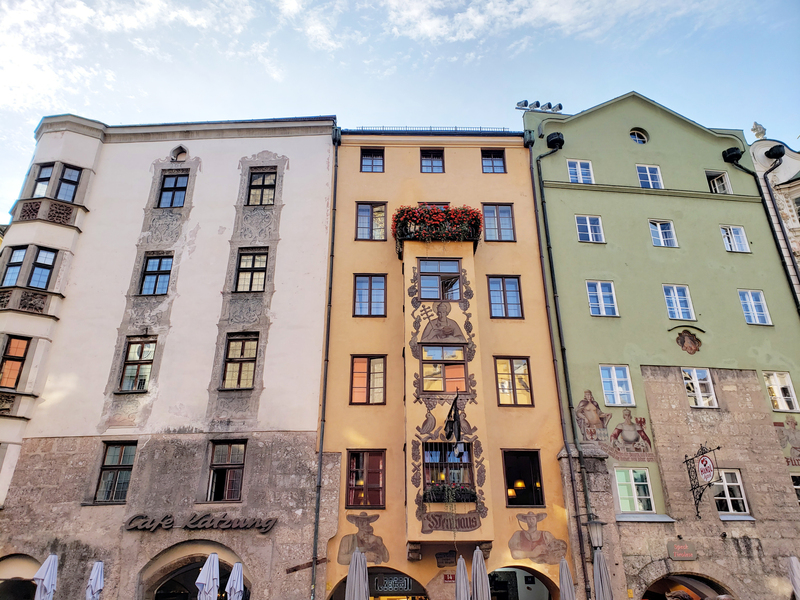 If you head to the Marktplatz, you’ll be greeted with an unobstructed view of one of Innsbruck’s famous street scenes along Mariahilfstraße; the row of colourful buildings with the imposing Nordkette in the background. 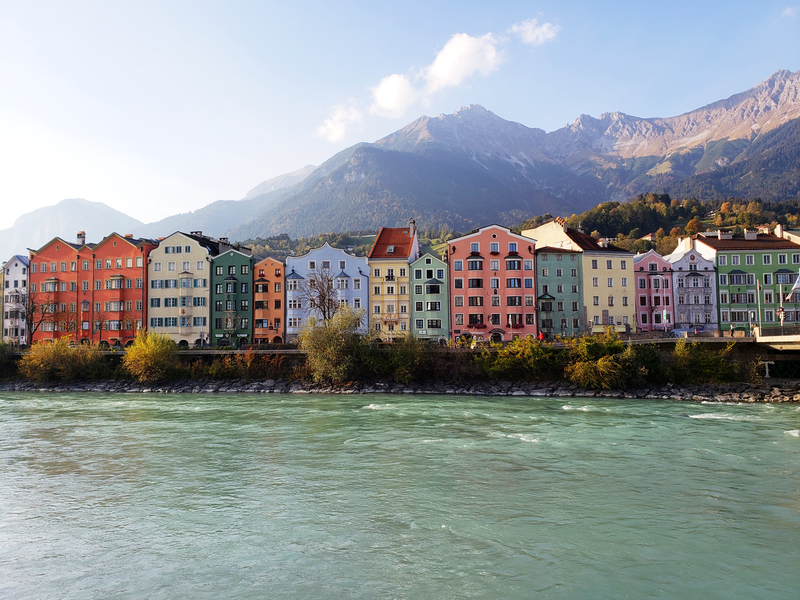 When the sun hits the river and houses at the right spot, the river turns a sparkling turquoise and the houses burst with colours that even a Crayola crayon box would be jealous of. 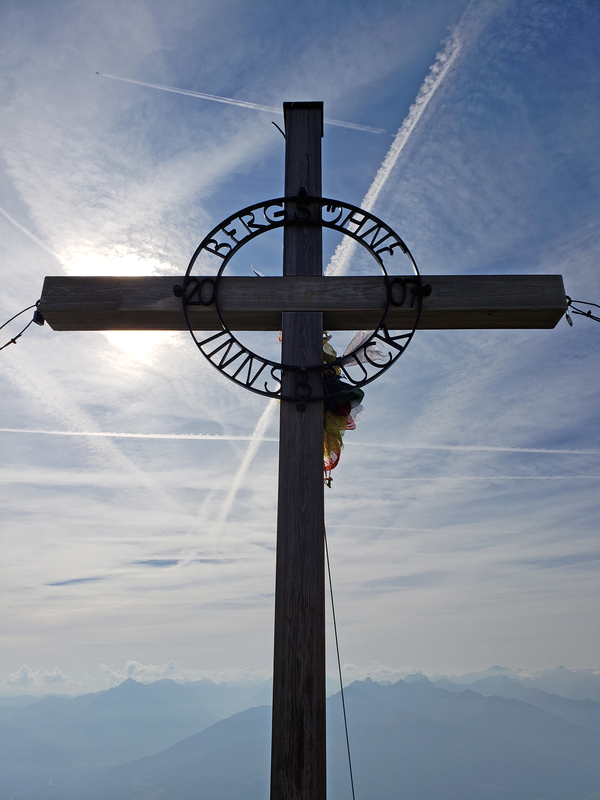 Photo tip: This same area is perfect for sunset gazing as well. 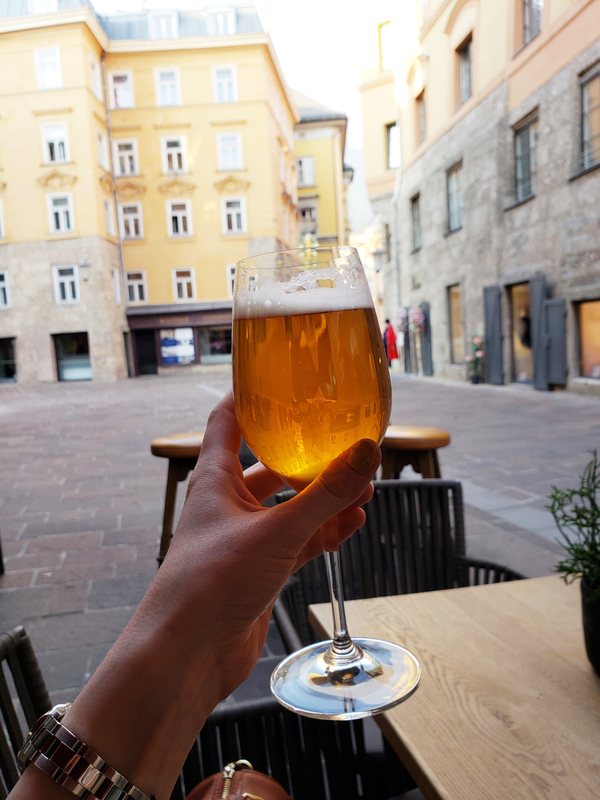 If I’m going to buy a city card, I need to know that I will get my money’s worth and with the Innsbruck Card…I definitely did! 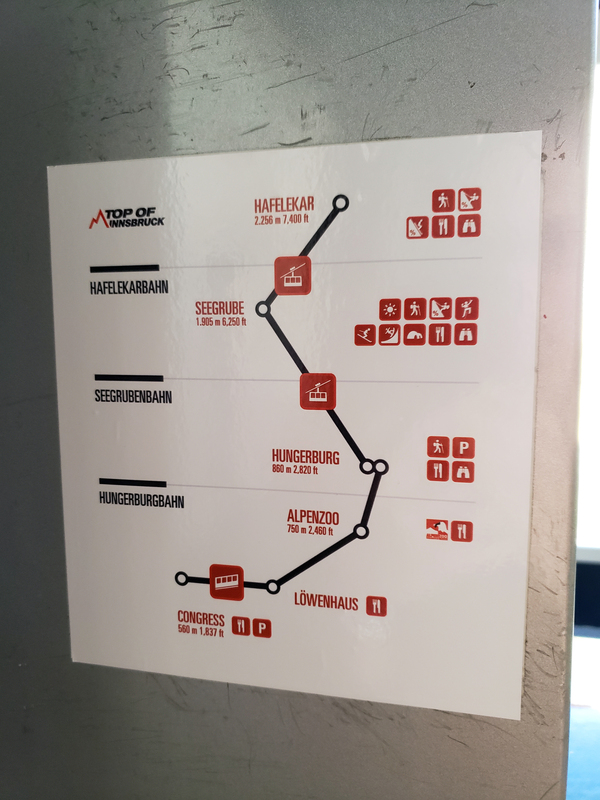 I decided to snag a 24 hour Innsbruck Card during my visit and for the cost of € 43,00, the card paid for itself in no time. 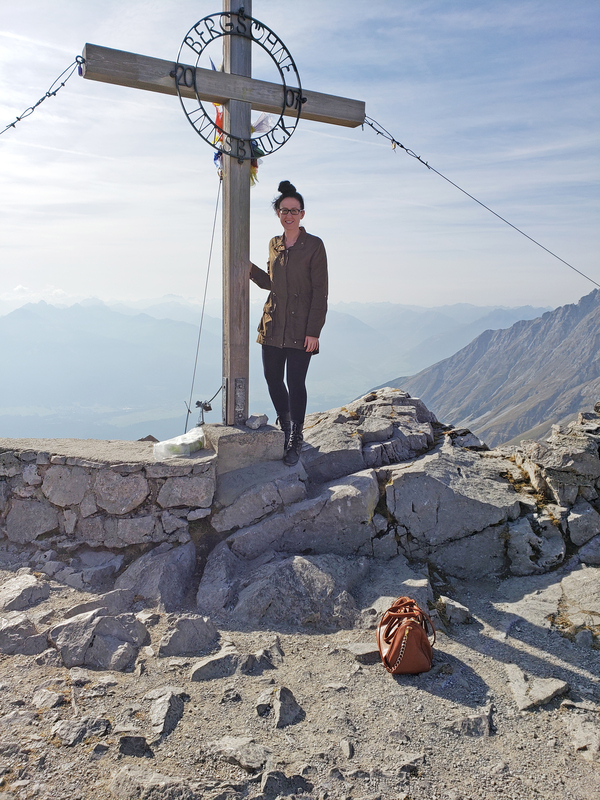 I was able to purchase the card before heading up The Nordkette, and use it towards my cable car ride up to the top. 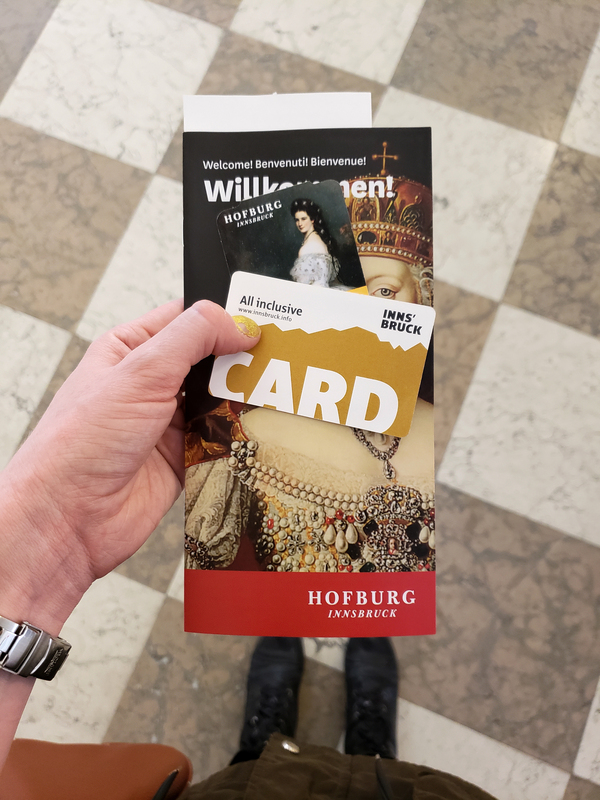 I was also able to visit The Hofburg for free and the Stadtturm for free. 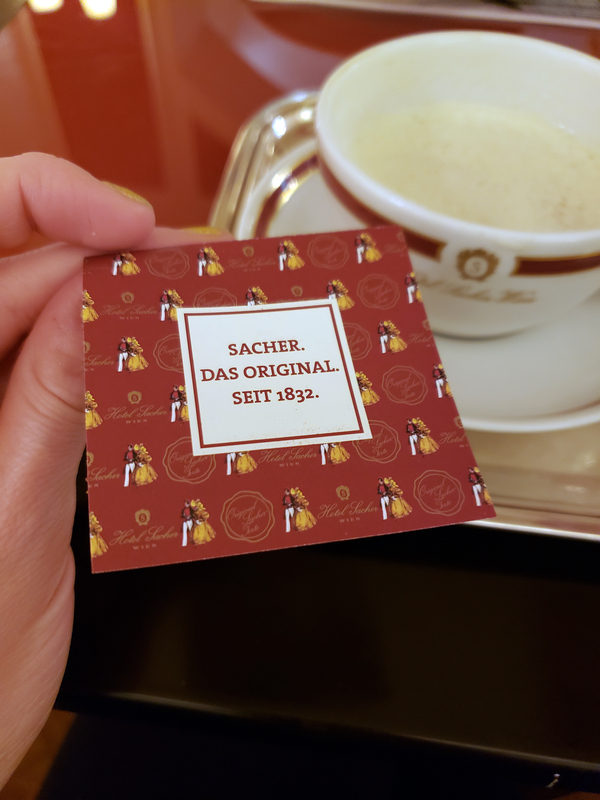 The Innsbruck Card is a great way to keep some of your dollars (Euros) in your pocket and it allows you to skip most of the lines as well. 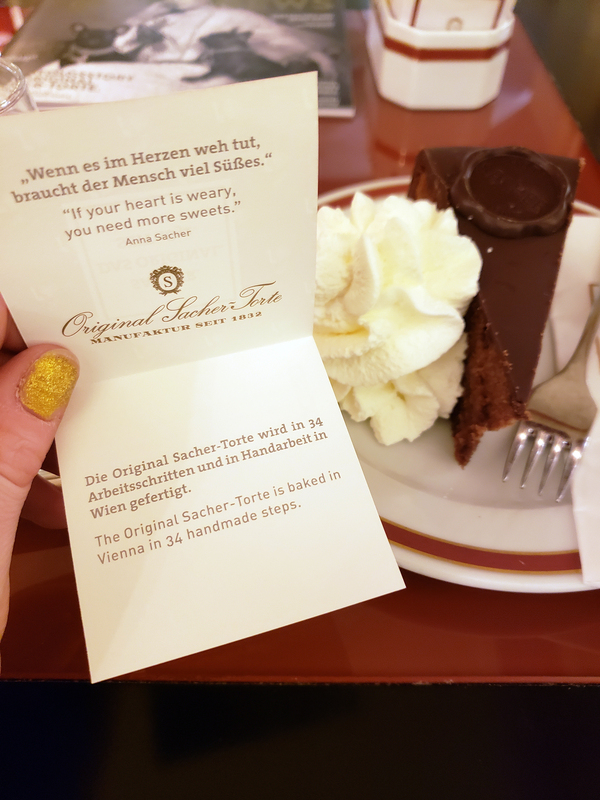 In total, I saved about € 20,00 just by buying the card. 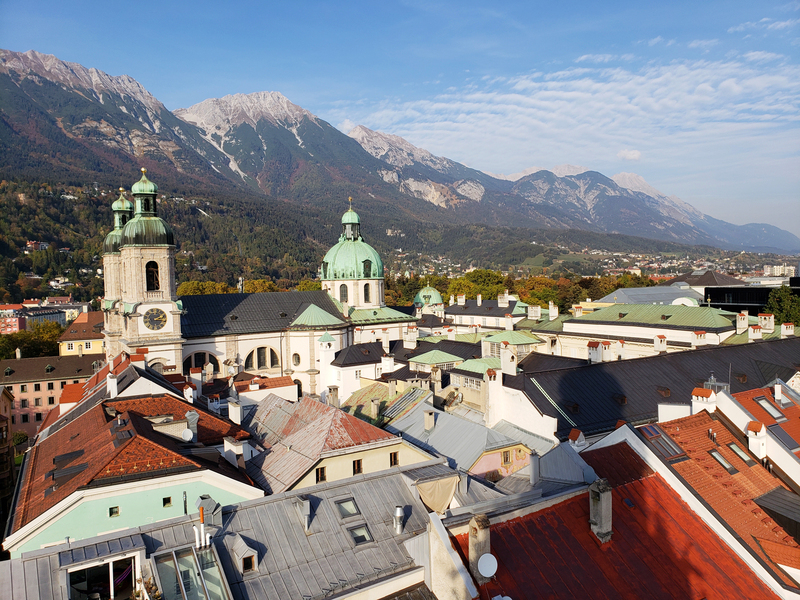 Like most city cards, the Innsbruck Card is available for 24, 48 or 72 hours and kids aged 6 to 15 years receive a 50% discount. 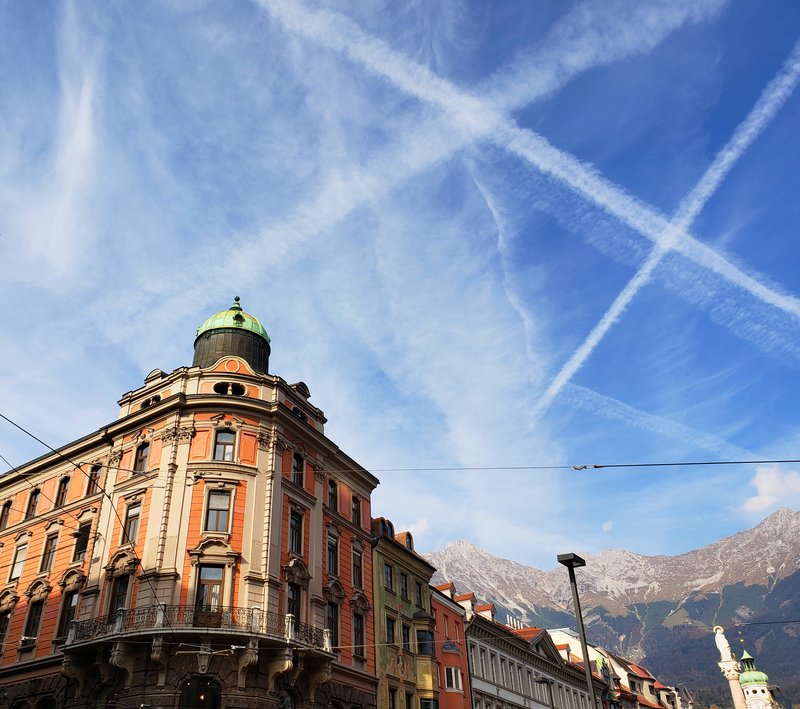 The Innsbruck Card, like any city card, is valid from the time when it is first used. It is valid for the precise time stated, so exactly 24, 48 or 72 hours after the first use. This applies in every case, regardless of the time that the first use occurs. So, if you by the 24 hour card and use it at noon when you buy it, you’ll have until noon the next day before it expires. Kapeesh? 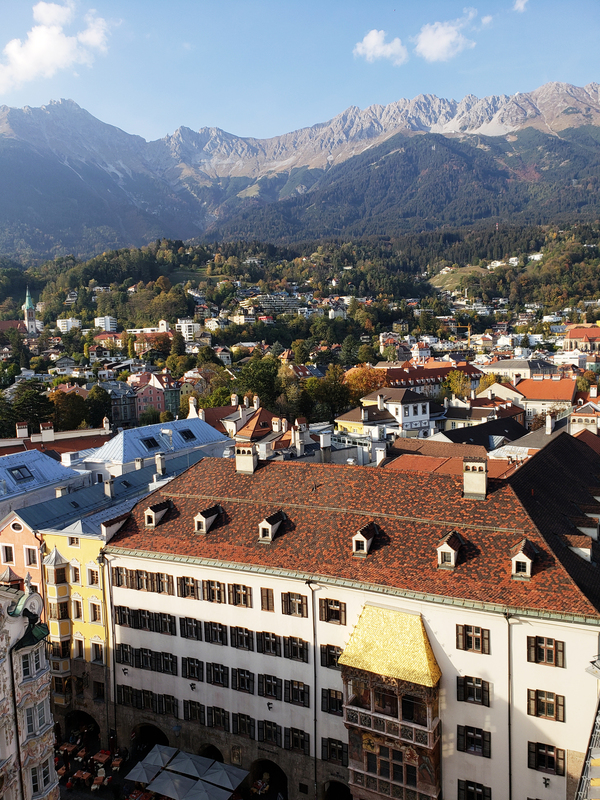 Innsbruck definitely spoiled me with its stunning mountain views, quaint cobblestone streets, friendly locals, great food and history. I didn’t want to leave. 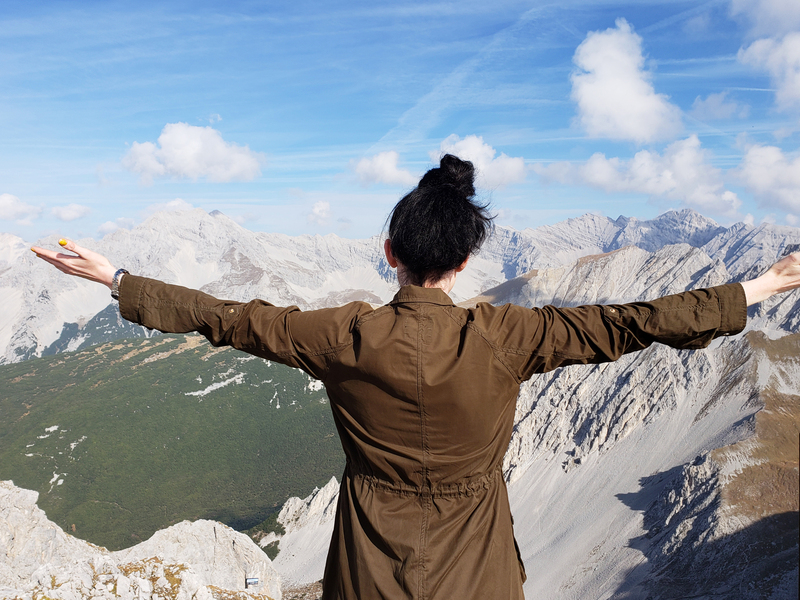 I know Innsbruck and I will meet again because when I find a place I truly, absolutely, whole-heartedly fall in love with, I know I’ll be back…I need to go back. 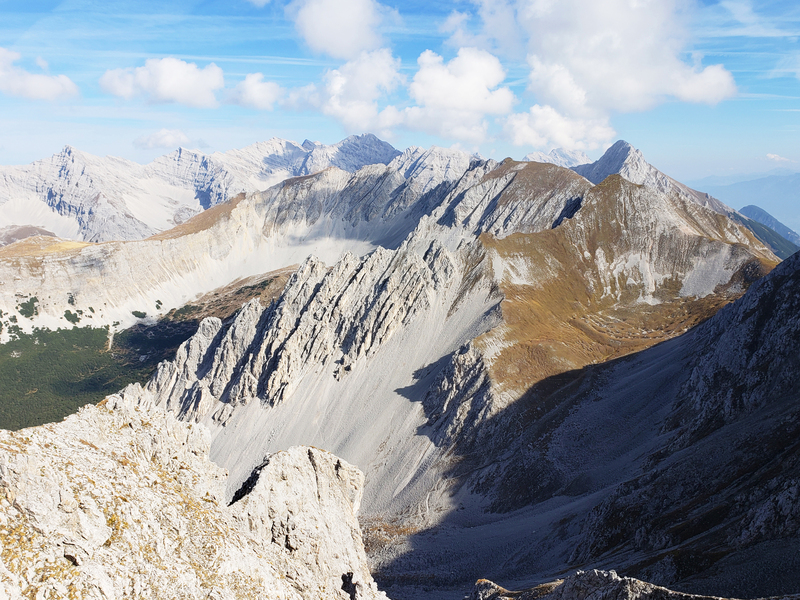 I guess that’s why they call Innsbruck “The Heart of The Alps”; because maybe everyone that visits leaves a piece of their heart behind? 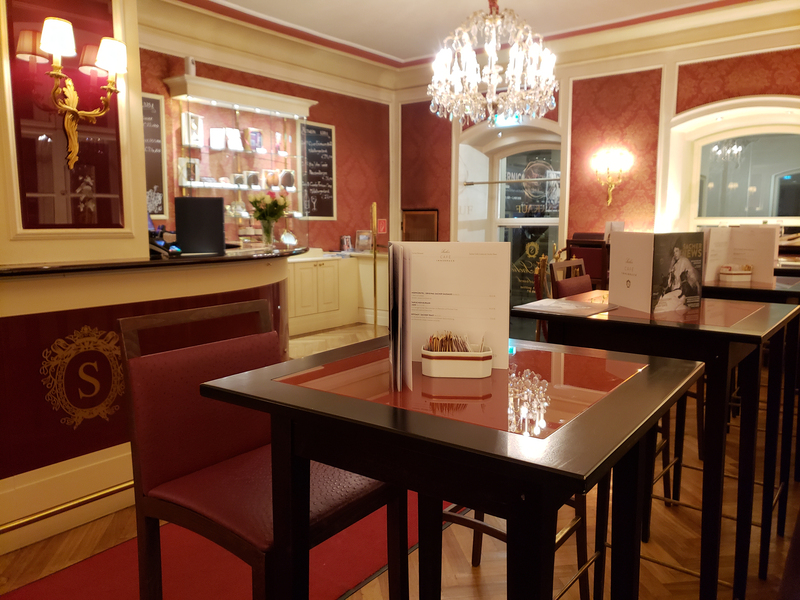 While in Innsbruck, I stayed at the PENSION STOI Budget Guest House just a short three minute walk from the train station. The rooms are comfortable and the staff is very kind and accommodating.